Or, how we can learn to start worrying and end nuclear terror. With all the bad news filling the headlines, we are thrilled to trumpet something uplifting: the awarding of the 2017 Nobel Peace Prize to the International Campaign to Abolish Nuclear Weapons (ICAN), a scrappy coalition of groups from around the world that played a decisive role in the adoption, this past July, of an international treaty banning the production, possession, and use of nuclear munitions. 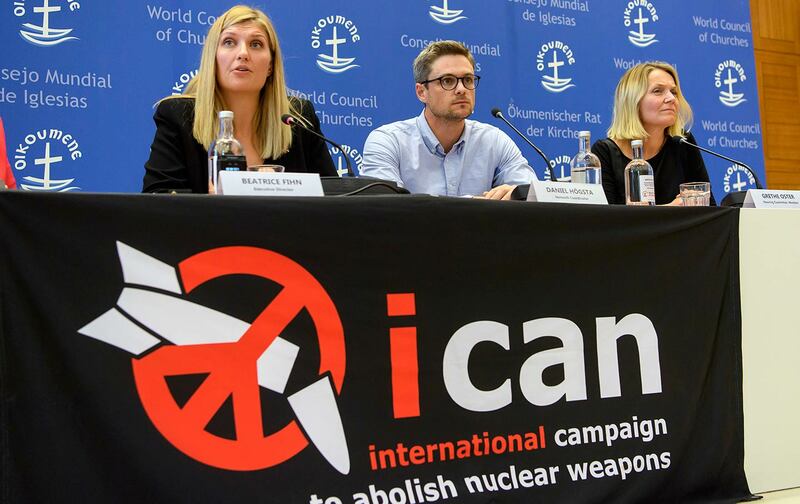 While many activists had become discouraged over the prospects for further progress on the nuclear issue, ICAN turned the tide by emphasizing the humanitarian impacts of a nuclear war, which would affect every country on the planet, whether or not they were parties to the fighting. As the Nobel Committee ruefully acknowledged, the Treaty on the Prohibition of Nuclear Weapons “will not in itself eliminate a single nuclear weapon,” given that the nuclear-armed states have shown no interest in signing it. For the organizations and governments that share ICAN’s objectives, this means a lot more work ahead to bring the treaty into force (this will occur when 50 nations ratify it) and persuade the nuclear-armed states to join it. Needless to say, this will not, in today’s fractious political landscape, prove an easy task. Propounding and establishing a norm against the use of nuclear weapons has never been more critical. For decades, we have been spared unimaginable death and destruction in part because of arms-control treaties that reduce the risk of a nuclear exchange, and in part because of the disinclination of leaders to be the first to order such a strike since the US bombings of Hiroshima and Nagasaki in 1945. This nuclear taboo was especially evident during the Cuban missile crisis of October 1962. Ronald Reagan, in his final years as president, and Soviet leader Mikhail Gorbachev also came to recognize the horror of nuclear war, and so discussed the elimination of these weapons. Today, any reluctance on the part of key world leaders to use or threaten to use nuclear weapons appears to be vanishing. One after another, top officials in Russia, India, Pakistan, North Korea, the United States, and NATO have taken steps or made statements indicating a greater inclination to employ such arms. Russia, for example, appears to have violated the 1987 Intermediate-Range Nuclear Forces Treaty, which prohibits ground-launched cruise missiles with a range of 500 to 5,000 kilometers, by deploying a cruise missile capable of flying within that range. Moscow has also adopted a strategic doctrine that calls for the early use of nuclear weapons in the event of a major NATO assault on its territory—a move that has been cited in the West as justification for the deployment of additional nuclear-capable aircraft and cruise missiles to deter the Russians. In much the same manner, military officials in India and Pakistan have announced plans to employ nuclear weapons at an early stage in any major encounter. However, nothing is as troubling as the statements by Kim Jong-un of North Korea and Donald Trump of the United States suggesting an unfettered readiness to employ nuclear weapons in any future confrontation. The North Koreans have often used inflammatory language, threatening to engulf South Korea in a “sea of fire” if it threatened the North, but many US and foreign officials were shocked in August when President Trump warned that the North “will be met with fire and fury and, frankly, power the likes of which this world has never seen before”—an unmistakable reference to nuclear weapons. The path to increased nuclear-weapons acceptance will be further cleared by Trump’s expected decision to “decertify” Iran’s compliance with the 2015 nuclear accord, formally known as the Joint Comprehensive Plan of Action (JCPOA). Under the plan, Iran agreed to curb its uranium-enrichment program for 15 years and to take other steps aimed at eradicating its capacity to produce materials for nuclear weapons—all under international inspection—in return for the suspension of economic sanctions imposed by the United States and the European Union. In decertifying Iranian compliance, Trump will claim that Tehran has violated the “spirit” of the agreement by continuing its missile buildup and aiding insurgent groups such as Hezbollah in Lebanon and the Houthis in Yemen—activities not proscribed by the agreement. Under US law, Congress will then have the authority to reimpose sanctions, a step that would constitute de facto annulment of the agreement. Congress could also call upon the administration to renegotiate the agreement, a step that is likely to go nowhere, as the other signatories—Britain, France, Germany, Russia, China, and the European Union—have expressed satisfaction with the JCPOA and Iran’s compliance with it. The danger in all this is that anti-Iranian hard-liners in Congress—Democrats as well as Republicans—will eventually vote to reimpose sanctions on Iran, leading Tehran to abandon the JCPOA and, under pressure from its own hard-liners, resume nuclear enrichment. This could lead in two directions, both equally frightening: Iran could eventually acquire nuclear weapons, leading other nations in the area to do so as well; or the United States and Israel, alone or together, could attack Iranian nuclear and military facilities before they reach full weapons capacity, sparking a regional conflagration. There is no doubt that we have entered an era of greater nuclear-weapons acceptance on the part of major world leaders—and this, in a moment of crisis, could make the difference between restraint and impulsiveness. As Nobel Committee chair Reiss-Andersen stated: “We live in a world where the risk of nuclear weapons being used is greater than it has been for a long time.” All this makes the task of repudiating such insanity and reinforcing the taboo against their use that much more urgent. This year’s awarding of the Nobel Peace Prize to ICAN should be viewed, then, as a moment to celebrate a genuine accomplishment on the road to peace as well as a call for redoubled efforts to bolster the taboo against the use of nuclear weapons. Among other things, this means supporting ICAN in its drive to press for worldwide ratification of the nuclear-ban treaty while also pressuring our representatives to eliminate Trump’s ability to launch a nuclear first strike without congressional authorization—a measure introduced by Senator Edward Markey and Representative Ted Lieu—and to combat the president’s bellicose stance on North Korea.